The United Church of Canada is a church with a rich, progressive, and continuing history of welcoming all in the name of Christ. The United Church of Canada is a mainline Reformed denomination and the largest Protestant Christian denomination in Canada, and the largest Canadian Christian denomination after the Catholic Church. In 2011, Statistics Canada reported approximately 2 million people identifying as adherents. The United Church was founded in 1925 as a merger of four Protestant denominations with a total combined membership of about 600,000 members: the Methodist Church, Canada, the Congregational Union of Ontario and Quebec, two-thirds of the congregations of the Presbyterian Church in Canada, and the Association of Local Union Churches, a movement predominantly of the Canadian Prairie provinces. The Canadian Conference of the Evangelical United Brethren Church joined the United Church of Canada on January 1, 1968. The Kelowna townsite was laid out in 1892, and by 1898 the community growing on the shore of Okanagan Lake began to show that it would become a permanent settlement. As people came so did the travelling missionaries and students of both the Presbyterian and Methodist churches. The Presbyterian Church in the area was Bethel Presbyterian built in the Benvoulin area in 1892. The student ministers travelling from Vernon to preach also came to Kelowna and held services in the school or Lequime’s store. In 1898, land at the corner of Bernard Avenue and Richter Street was donated by A.B. Knox, an early rancher and land developer, to build a Presbyterian Church. The Rev. R. Boyle was the minister for the joint Benvoulin-Kelowna charge. A small church, seating 140 people was built and dedicated on Christmas Day, 1898. History tells us that the building was free of debt when completed. In 1903 the first Methodist church was built in Kelowna. The cornerstone of the present brick church was laid in 1909, and this church, built of locally kilned brick, was dedicated in October 1910. The Sunday School hall was built in 1928-1929. There have been a number of other additions and renovations over the years. Early in 1914, the congregations of the Methodist and Presbyterian churches began to talk with each other about forming a joint congregation. In August 1916, agreement for Basis of Union was made between the Kelowna Methodist and Knox Presbyterian congregations and the Union Church came into being. In January 1924, again prior to the national churches, the congregation of Kelowna adopted the Basis of Union outlined for the formation of the United Church of Canada. The women of the congregation bought the Casavant pipe organ in 1925 to commemorate the formation of the national church. 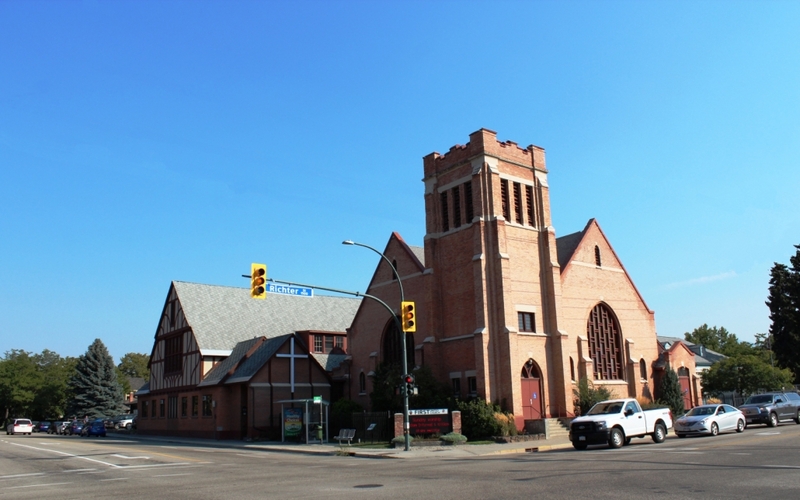 In 2002, the congregation of First United voted in favour of asking the City of Kelowna to designate the Church buildings as a Municipal Heritage site. As a community of faith, our roots extend back much farther than the dates included in this sketch of our congregation. As people of God we trace our Christian ancestry through the Church to the apostles – even to Jesus Christ who called them and us into discipleship. The construction of the large brick Knox Presbyterian Church began in 1909 and was completed in 1910. Donations included the new bell for the bell tower, the pulpit and some of the interior furnishings that were necessary in the new church. Sunday School rooms were added in 1919-20. The present day Casavant pipe organ was purchased with money raised by women of the congregation in 1925. The school and hall were built in 1928-29 on the lot next to the church. The new hall and school expanded the Sunday school and provided a hall for many other community activities. After the major addition of the hall, the church has undergone numerous renovations and alterations over the years. 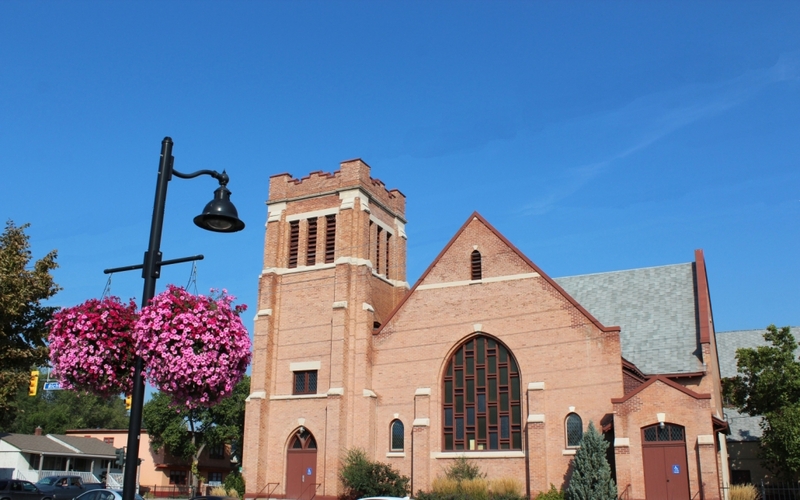 In 1938, a new furnace was installed in the church building, as well as some repairs were made to the brick work on the exterior of the church. In 1941 the pews on the south and north sides of the church were rearranged to face toward the pulpit and the organ; the original brass rods and velvet screening which hid the organ console, were replaced by a wooden screen and carpet was laid in the aisles. In 1943, the wooden first Knox church was torn down. The next set of renovations took place in 1947-48 when the congregation made the decision that the number of activities had grown so much that it justified the need for more space. There was the addition of Sunday School rooms, a boardroom and a full basement were added to the south end of the hall behind the stage. In 1951, installation of a new sawdust-burning furnace was necessary when the hall’s wood burning furnace broke down. The conversion of the church furnace into a sawdust-burning furnace also happened at this time. In 1957, the congregation purchased the adjoining property (known as the Balfour property) on the east side next to the hall for a parking lot. In 1962, there was another set of renovations to the church and hall. The changes to the church’s interior included the screening of the organ pipes; the choir location was changed; the sawdust furnaces were replaced with new gas furnaces; new electrical wiring was installed in the church. The two large sanctuary windows were likely removed and replaced with the existing 1960s windows at this time. By 1967, the renovations to the church hall and the upstairs Sunday School rooms were completed. In the 1990s the kitchen was up-dated, the organ was restored including uncovering the organ pipes (removing the wood screen). The pipe organ had been gilded in 1945. The organ used to be in the centre front along with the choir. When the organ pipes were covered with a screen, the choir was moved to the northeast front corner of the sanctuary. The organ pipes have once again been uncovered (as they were originally built) and the choir once again is close to the same area as it once was. The brickwork in the upper portion of the bell tower was restored in 2000 at a cost of about $47,000, with a $5,000 grant from the Kelowna Heritage Foundation, and $15,000 from the B.C. Heritage Foundation. The sanctuary and hall have had a new roof put on in sections over the past eight or so years, receiving financial support from a number of Kelowna Heritage Foundation grants. In 2005-06 the administration offices and reception area were consolidated and relocated to the north end of the hall. The stage in the hall was removed and this area was turned into a meeting room. The Memorial Lounge was relocated. In 2006, new high efficiency furnaces were installed, to replace the old and outdated ones. The age of our church buildings will require on-going maintenance and careful attention to the needs as they arise. Beginning its work in 2017, FirstUP! is an initiative of the Board to look at how our building can meet the challenges of the next century-or-so.